In an effort to gauge human impact on ecosystems, scientists at NASA and the World Wildlife Fund recently published estimates of how much of Earth’s plant life humans consume for food, fiber, wood, and fuel. By understanding patterns of consumption, and how the planetary supply of plant life relates to the demand for it, these results may enable better management of Earth’s rich biological heritage. Understanding the patterns of supply and demand is critical for identifying areas of severe human impact on ecosystems and planning for sustainable future growth. The details of this study appear in the June 24, 2004, issue of Nature magazine. Using data collected between 1982-98 by the NOAA Advanced Very High Resolution Radiometer, the researchers calculated the total amount of carbon absorbed by land plants each year and fixed in plant structures—a measure referred to as “Net Primary Production,” or NPP. 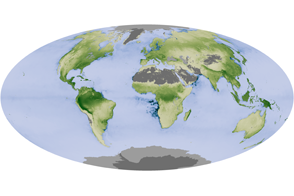 Then the researchers used computer models to estimate how much of Earth’s land-based net primary productivity is consumed by humans. They found that humans require 20 percent of the NPP generated on land every year. Of course, consumption varies greatly by region and is influenced by three factors: population, per capita consumption, and technology. For more details, please see the NASA press release, entitled NASA Scientists Get Global Fix on Food, Wood, & Fiber Use. 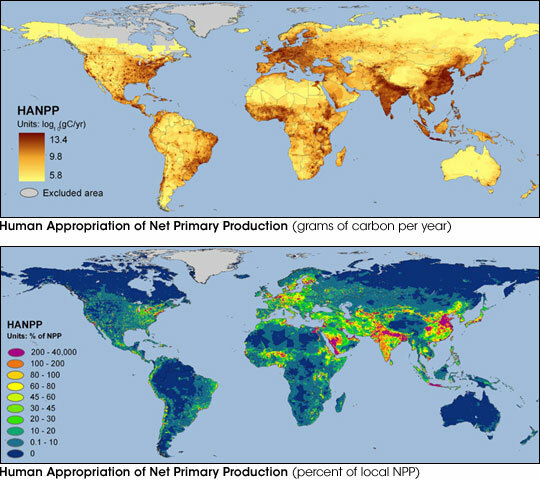 The maps above show human appropriation of land-based net primary production. The shades in the top map represent billions of grams of carbon consumed each year for a given location on Earth. Tan shows low values while dark brown shows high values. The bottom map represents the percentage of NPP consumed by humans each year for a given location. The map reveals that in certain places—such as the northeastern United States, much of Europe, the Middle East, as well as Southern and Eastern Asia—humans consume far more of plants’ net primary productivity than is locally produced. Therefore, people living in these areas must import food, fiber, wood, and fuel in order to meet their demands for products derived from plants.